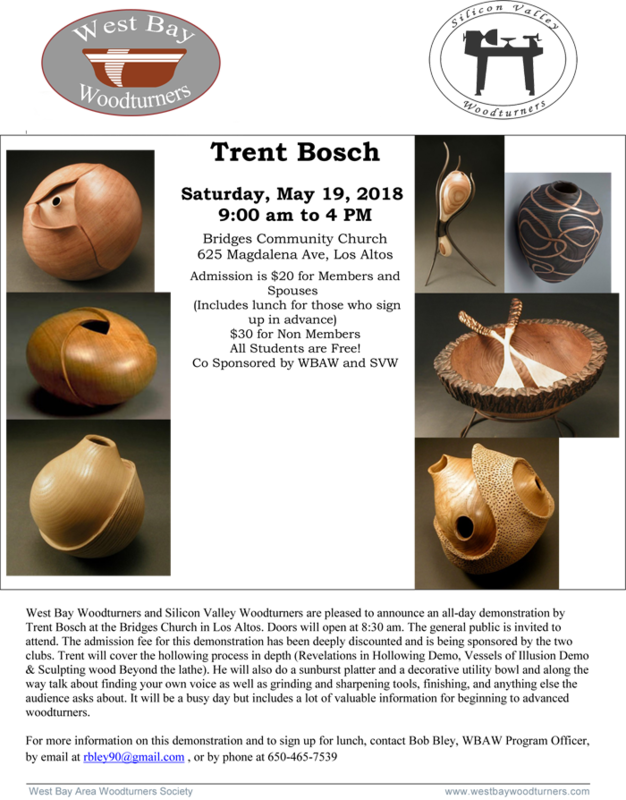 See the demonstration flyer here and below. Does this presenter look familiar? Claude was here in February to show us how to hollow the bottom of this vase and prepare a bottom plug. The plug was glued to the bottom. 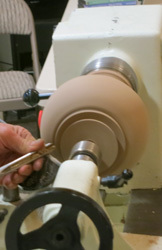 Claude centered the piece in the lathe, bottom exposed. Then he cleaned the glue joint and trued the bottom tenon. Then he turned the piece around exposing the neck of the vase. He drilled a hole into the neck to connect to the hollow of the vase. This hole may be tapered, the neck turned down and the bottom tenon removed in subsequent steps. 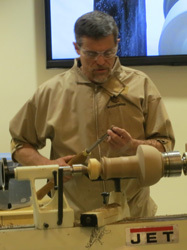 I traveled to the Wine Country Woodturners meeting with Mike to see John Jordon demonstrate. It has been a number of years since he was at our club. If I remember right, he did it at Don Bonnett's shop. We had a good time, and I was inspired to try hollowing again. I'm just plain bad at it, but he gave some good tips and I think with a little practice I might even get to an acceptable finish. Like almost all the turners that I've met, we had a lot of good company! You should give them a try if you are in the area! 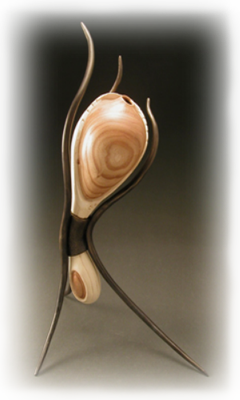 Next on our demonstration schedule is Trent Bosch. We will be hosting this demo on May 19th. For $20 including lunch, you can't beat it. So mark it down on your calendar and plan to join us for a good time! In the mean time, don't forget about our up coming club meeting on the 8th. See you there. Mark your calendars. This is always a 'not to miss' affair. But...we need volunteers. This BBQ will not run itself. Contact Bud Trapp or a board member. This is a video by Jimmy Clewes On "Sharpening and Using the Microbevel". What is a 'microbevel'? Watch the video and you will find out. 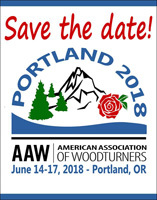 Never mind the AAW promotion at the start of the video, be patient, you will be pleased with what you see. Click here for the video link. Also there is an article "Box Lid Alignment Pin," by Alan Falk, from the October 2017 issue of American (in case you missed it). It sure is an interesting idea. Click here for a readable PDF. 2018 WBW board members and committee chairs.